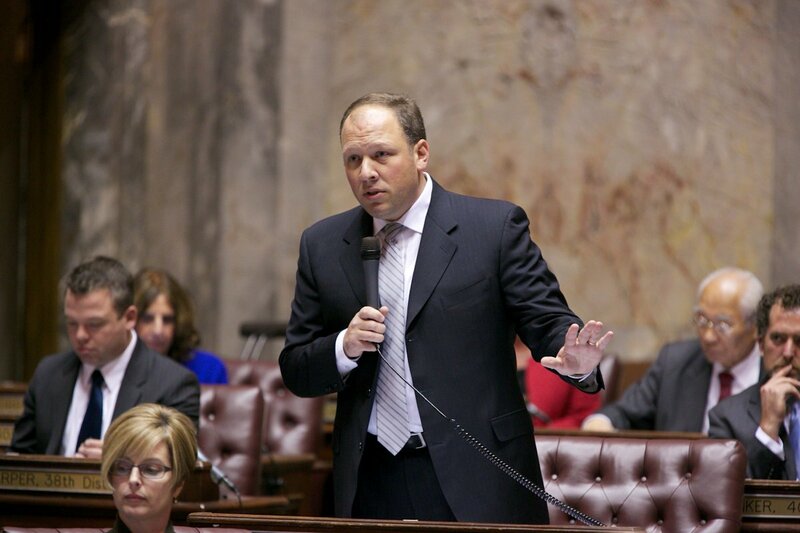 Sen. David Frockt represents Washington’s 46th Legislative District, which covers part of Seattle, Kenmore, and Lake Forest Park. Frockt is Vice Chair of the Senate Ways & Means Committee and serves on the Health & Long Term Care Committee and Behavioral Health Subcommittee. 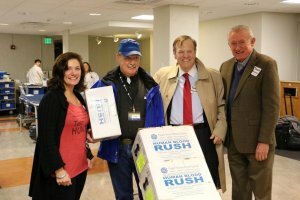 He’s the prime sponsor on the Senate public option bill, also referred to as Cascade Care. We’ve written updates on the House and Senate bills — which were originally requested by Gov. Jay Inslee — throughout the 2019 session. 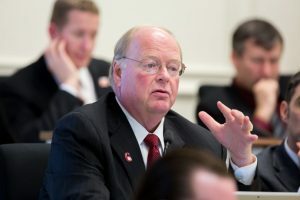 The bills have each changed since their initial public hearings, and now are being considered by the opposite chambers. The Senate bill Frockt introduced is scheduled for executive session in the House Health Care & Wellness Committee on Tuesday; the House bill, prime-sponsored by Rep. Eileen Cody, was passed out of the Senate Health & Long Term Care Committee Monday afternoon (including the amendment Frockt foreshadows below). Wire reporter Sara Gentzler talked to Frockt Monday morning about how the bills differ and what’s next for Cascade Care. Sara Gentzler: What are the differences between the House and the Senate bill now, with both of them scheduled for executive session in the next couple days? Sen. David Frockt: The bill that’s pending in the Senate health care committee, I think, is going to be executive sessioned today. It’s the House version — the one Rep. Cody passed off the House floor. I believe what I intend to do, at this point, is I’m going to offer an amendment, which will, basically, just lay the Senate version on top of this bill. So, it will have the same language that passed out of the Senate. I’m really doing that as more of a placeholder, while negotiations and discussions continue on the bill. I don’t think there’ll be any major controversy within the committee, because we’re doing something that already got 36 votes in the Senate. That’s the plan for the House bill, at the moment. In speaking with Rep. Cody, I believe she thinks that the Senate bill is likely to be the vehicle, because she can amend it and send it back to the Senate. And then we would have to vote on a concurrence. If I could summarize, I think there are a number of ideas going around. The main tension is around whether or not there should be some kind of a rate established in statute, or some kind of aggregate cap that is tied to Medicare rates in statute. So, you would say, ‘The rates that shall be utilized under this plan will be, on average, Medicare + x.’ Whatever ‘x’ is, I think, is a subject of some discussion. There is a lot of language that is being circulated among various stakeholders and proposals related to active purchaser and how you would incorporate that. And, for those of us who are in the policy-making realm, I think that — I don’t want to speak for Rep. Cody — I’m certainly open to all of these ideas. But, I think, the main thing is we have to be sure that we can get to a place where premiums are actually on a downward trajectory for those who are in the individual market and it has to be real savings…that it’s actually something that consumers will see, and we will see premiums going down for those who are in this market. The interesting thing, I think, from the standpoint of where this bill is: You have a split. You have the doctors, the hospitals, and some of the Medicaid managed care plans in one camp. You have some of the large insurers — like Premera and Regence — in another camp, who are actually asking for rates to be set in statute. Whereas, the first group that I mentioned really is not asking for that. They really are very concerned about that. And so, we’re trying to find some kind of medium that is going to work, but is also not going to distort the individual market in any way that you would actually have negative side effects. And I’m not convinced there would be, but that’s basically the tension we’re feeling. SG: You mentioned Medicare rates and that debate. What are you hearing from providers regarding those rates that was persuasive in changing your bill? DF: Well, I don’t think it was so much persuasive as wanting to work through the process to try to get to something that is workable and is not going to have negative effects. What was persuasive — that’s a good question. I became convinced that Medicare rates alone are probably not the right metric. Certainly, I think that would be a little low, but I don’t think that means there should be no rate or no rate mechanism to help put some sideboards around the way these plans should be issued. For example: Can the plans build out adequate networks at certain levels? Well, they’re going to have to pay, probably, higher rates for hospital specialties — those are, typically, much higher. But, they should be able to have somewhat lower rates, I would think, for primary care. And so, the question is: Should everything be Medicare rates, or should you have some kind of aggregate average so that you can have some flexibility in the way the plans design their networks? I am concerned about making sure these plans, whoever participates here, will be able to build out adequate network. So, I think that’s a legitimate concern. SG: I interviewed Meg Jones [Executive Director of the Association of Washington Healthcare Plans] recently. What if that worst-case-scenario projection from the plans comes true — what if it leads to the collapse of the individual market? What happens then, and do you think that’s a realistic outcome? DF: I don’t think that’s realistic. If you go back and look at the basic health plan from back in the ’90s and early 2000s, when we were at Medicaid rates…If you look at the aggregate, the data we have…all of the spending in this market is about 1.5 percent of the total federal health care spending in the state. So, this is a small percentage of the overall health care spend. I don’t foresee that happening. But I also think we need to be careful and make sure we get this right. I think you’ve got a major player like Kaiser Permanente that’s in a little bit of a different position, because they’re both a plan and a provider group. They have some unique concerns, and they have a pretty significant share of the individual market. So, we’re trying to balance all of those things. I guess I would say the main thing is we have to remember what the purpose of this is. The purpose of this is to — because of the Trump administration’s terrible policies — find a way to drive down premiums for this small group of consumers and also reduce their levels of cost-sharing to reasonable levels. SG: Obviously, the original goal when Gov. 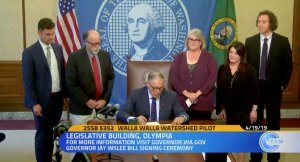 Inslee announced this was to keep those prices down and ensure that people ‘in every part of the state will have an option for high-quality, affordable coverage.’ This bill, as it stands now, is different in some pretty key areas — the offering on non-standardized plans alongside the standardized plans, you already talked about the rates — are you still confident it’s reaching the goal that it was intended to reach? DF: I think we have to see what the final bill looks like. I’m not so much worried about allowing other plans to be in that market. I thought that was a little restrictive, to say there could only be standardized plans and nobody else. My guess is that those carriers that want to participate, that they have to have a standardized plan, but they want to offer additional benefits for a higher price — that doesn’t strike me as a terrible thing for consumers. So, I thought that was a pretty easy give. My understanding, from talking to the Exchange and others who’ve looked at standardized plans, is in most markets where they have standardized plans but where they allow other plans to be sold and purchased, 80 percent or more of consumers end up buying things that are, essentially, standardized plans. So, I’m not terribly concerned. And, if that was a way to build support so that there is the ability to have some flexibility and for consumers to have more choice, to build political support for this, I thought that was a very easy, reasonable thing to give on. SG: It makes sense, then, that it’s mirrored in both versions of the bill. 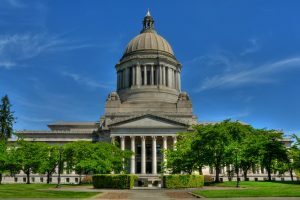 So, what about the idea from Cascade Care opponents who call it a ‘gateway to socialized medicine’ — I’ve seen Republican legislators put it on their lists of ‘bad bills.’ What’s your response to that sort of criticism? DF: Well, apparently it wasn’t that bad, because I got 10 Republicans to vote for it in the Senate. So, at least conceptually, I think people understand that this makes sense. I think, candidly, I don’t hear anything coming out of the administration or out of the other party that is giving me confidence that they have a plan that makes sense. SG: At the national level? DF: I mean, even here — what is their plan? What they were railing about on the floor of the Senate was the same platitudes we hear coming out of the same crowd in D.C. I think they’re fighting the last war. I was thinking about this: Obamacare is 10 years old. We shouldn’t call it Obamacare, it’s the health care system. That’s what we have. We didn’t call Medicare, 10 years after it was enacted, ‘Lyndon Johnson care.’ It was Medicare. This is the health care system, and the question is: Are we going to deal with the real world that we have today and try to improve the system, even in the face of this undermining that’s going on by the Trump Administration? Or, are we going to rip it up again and start over? Which is what they seem to want to do. And I don’t think that makes sense. You’ve got hundreds of thousands of people and, nearly, probably a million people who gained coverage under this system. It needs some improvements, and that’s what we’re trying to do here. I think that their railing against it — I take it as noise. Because I think the national elections have shown that most people do not have confidence in their proposed solutions. SG: Correct me if I’m wrong, but I think I heard you say in committee that this bill would be a kind of step toward universal coverage, as an idea? DF: The question, I think, is where we’re going as a country: Are we headed toward some kind of universal care system over time? I think it’s inevitable. But, I think, for right now, we’re trying to stand up the system and make the current system work better. You’ve got, sort of, two things going on: You’ve got a need to improve this aspect of the current health system while, at the same time, there are a lot of discussions going on about what it should look like a decade from now, or 20 years from now. And that’s all I was trying to say there. SG: Ok, a final criticism that I hear. This is, again, from when I interviewed Meg Jones. She mentioned that what she thought was missing from the bills was ‘a balanced assessment of what is driving the underlying cost of care,’ and that, without doing that, the new system would push cost-savings to another sector. What is your response to that? So, I’m not quite sure what they’re saying. I think the second thing to note is you’ve got two of their major members — Premera and Regence — testifying, essentially, that the Senate bill didn’t go far enough, that they want some cost containment built into the system, because they, obviously, feel they don’t have enough leverage with providers to drive down cost. So, that’s the other dynamic. So, I do think that, certainly, pharmaceutical costs are a key driver here. And, we passed a strong transparency bill out of the Senate that includes both pharmaceutical transparency and chain-of-distribution transparency through the PBMs. And that was a pretty strong bill. So, I think that’s a fair point, that this is not the only driver of cost in the system. But, all of these things have to be done in combination, I think. SG: So, how close do you think this is to its finished product and what are the next steps? DF: I’m anxious to see what Rep. Cody does with the bill in the House now and what they send back over. I have been in meetings with her, and we’ve had some other ideas floated just this weekend that were interesting, so I’m interested to see what she does there. As far as the Senate goes and our team — Sen. Cleveland, myself, and others who are engaged on this — I think we are absolutely open to working with the House and with all of the folks involved in this to get toward something that’s going to be workable. I think there’s going to be some pretty intense negotiations and work over the next 30 days. This interview was edited for length and clarity. It was also posted on our sister site, State of Reform.